what would sofia coppola wear? A friend of mine turned forty last month and we celebrated with an old-fashioned girl’s night out. There was little discussion about logistics and what we’d do (eat and dance here), followed by a serious discussion about what to wear. Here’s where I started to sweat just a little bit. A peek into my closet would reveal a solid selection of items for a casual day around town (with small children). Or, a wedding. But only if it were a destination wedding somewhere very far away and very tropical. With small children. Nothing felt current for a heels-and-cocktails night in the midst of a record cold winter. It got me thinking about how I used to be so into clothes. Fresh from college my first job paid less than $300 a month. I lived at home with my parents. I shopped. I pretty much lived at home with my parents so I could shop. After I met my husband and we were newly wed, we took vacations usually to an island or an old city somewhere. Our most favorite thing to do was to walk. For hours. For whole days at times. We’d stop in at any interesting-looking boutique or market. We’d fumble with a phrasebook and, usually, I’d walk out with something I could add to my shelves. 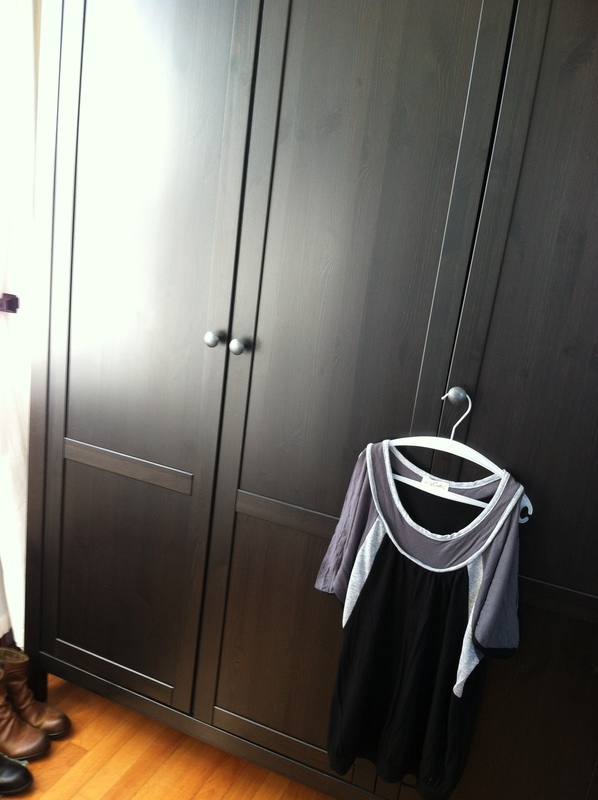 During these years, I amassed a small wardrobe that I loved. It contained comfy broken-in denim, a few pretty knits, and other casual pieces picked up over time and nowhere in particular. It also contained one or two things that hurt when I wrote the check. Nothing too crazy. But definitely a more grown-up closet. I would look it over every so often and do the things you might do: tailor this, toss that. If something wasn’t working any longer, I would purge it. There was a sense of urgency to my wardrobe needs. If I wanted a specific item, I would go out looking for that one thing. A maximizer, this is what my husband calls me. I would search until I had found the right one thing. And all would be well again. Ever so slowly, life began to shift. We had our first daughter. Then our second came along. And with these things came less focus and energy spent on clothes and shopping. Back then I would go days in the same outfit, and that was A-ok. So as this birthday weekend approached, I made a real effort to find something I liked and felt comfortable in. I realized that while I used to enjoy lightweight, unstructured pieces (no bra necessary), nowadays I tended towards a demi-sleeve and sturdier fabrics. I went to a part of town known for its boutiques. Like in earlier days, I pulled out piece after piece. I had a mantra. As I reached for each item and looked it over, I asked myself: Would Sofia Coppola wear this? It’s silly, I know, and not that effective because as my best friend pointed out: Ahem. You don’t have Sofia Coppola’s budget. But I have long admired her choices. In the end I chose something I owned. It was a black tunic with a panel of metallic stitched around the collar. I paired it with dark leggings and wedge heels which I took from my stylish mother. And I had a fantastic time. It made me think that while my wardrobe is a much smaller focus these days, it still brings me the same joy. There is a sense of discovery in unworn items brought back to life by a new occasion or a new pairing. And there is also a sense of comfort in things well-worn. But still very, very functional. What a classy lady she is! Good choice. Previous Posttumbling through life and parenthood: two interviews worth reading. Next Posthow old are you really? here’s a concept.